Whether you have a new website idea, wanting to launch a new blog, or planning to migrate your current website to a new hosting provider, knowing the right hosting plan is paramount. However, for many, web hosting can be complex, and you can easily get confused and overwhelmed with the many different options available to you. Thanks to the proliferation of online businesses and the advances in technology, there’s a huge demand for web hosting. Even small and medium businesses nowadays would create for themselves and online presence by putting up their own websites. With this huge demand means a huge supply. Today, a search in the Internet can show you countless of hosting companies, plans, and pricings. These can make it difficult for you to decide which one is best for your own company. To add more complication, the progress in computing technology provides you cloud-based solutions that extends to hosting, giving you more possibilities. So before you decide which hosting company you want to host your site, you must first determine what kind of hosting service you need, starting with the most common hosting types: Shared Hosting and Cloud VPS Hosting. Let’s take a closer look at both hosting plans. Shared hosting refers to a hosting plan wherein you share storage in a web server with other users. This means multiple websites are hosted altogether on one server, sharing resources such as disk space, bandwidth, and databases. This type of hosting plan requires that a web hosting provider put up a dedicated web server for multiple sites. Shared hosting plans are commonly more affordable because you also share the costs with other websites or users. Since many sites use one dedicated server, the providers can come up with affordable price points, dividing the costs among its users. While this hosting plan is easier on the pocket, it still has some drawbacks. Its strength, being a shared storage and resource for many websites, can also be its weakness. This is because this shared scheme can also expose your files to other users, making it less secure. Furthermore, any error from one user can also affect other users. For example, when one site gets high traffic, you can expect other sites to have downtimes. Another scenario is when there’s an error in one site’s script, it can cause dysfunction in other sites within the same server. However, many hosting providers were able to remedy this by not allowing or authorizing users to run their own programs under shared hosting. If you are a small business with not a lot of traffic on your site, or you don’t need to run your own program, then this can be a good option for you. There are some well-known and quality hosting companies out there offering affordable shared hosting services, such as A2Hosting or Bluehost (read A2hosting reviews here). What is Cloud VPS Hosting? VPS hosting stands for Virtual Private Servers. This hosting plan allows you to use storage and other resources of multiple servers. This is very different from Shared Hosting, wherein your site is confined in one server location. 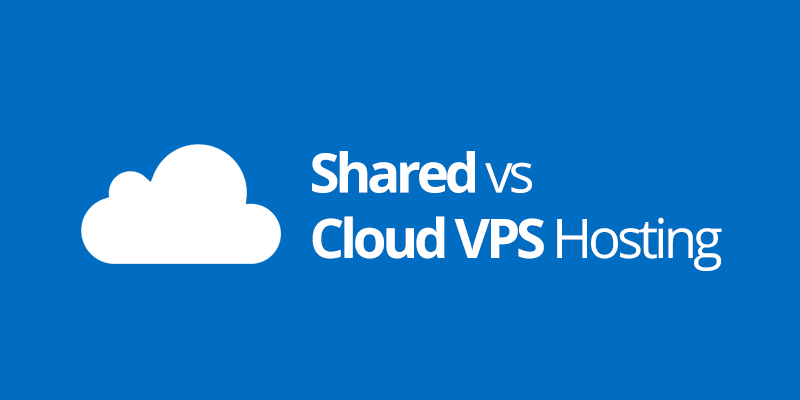 With Cloud VPS hosting, you experience many advantages that Shared Hosting can’t provide. This is why Cloud Hosting is the choice for many high-traffic sights as well as those that want to keep their data secure. This is because if there is an issue with your site, it can be transferred to another server which is part of the cluster that hosts it. This type of hosting plan is based on cloud computing technology, wherein multiple machines work together seamlessly and simultaneously as one entity. However, with cloud hosting, your machines are basically virtual. This makes it more secure and reliable, as well as affordable and flexible. Therefore, sites using cloud hosting experience impeccable uptimes and smooth performance. Storage, bandwidth, and databases are also unlimited. This means you can easily scale up without any issue. Furthermore, it’s more affordable, averaging at US$20 per month. However, this plan is more advisable for users or sites that have their own webmasters so you can run your own program. Which are Your Going to Choose? Now, if you are a business or brand planning to put up a site or migrate your existing one to a different hosting provider, it helps to look at what your contemporaries or competitors are using. company website and compare their plans. Whatever hosting plan you choose, make sure to first weigh the pros and cons against your site’s and business’s unique needs. Determine what you have planned for the immediate and longer-term activities of your site. Find the hosting company used for a website.